The origin of this phony intolerance springs from one source: the desire to be cool. Everything done in life these days springs from a fear of dorkiness. I called this “dorkophobia,” and every time you use it, I get three dollars. Despite the fact that it’s the uncool who make the trains run on time, it’s the cool to get the cred. The definition of cool: mass popularity without much achievement. It’s how Obama got elected. Ask anyone who voted for him, “Why did you do it?” and the convoluted, wide-eyed answer will ultimately be translated into: “He’s cool and that other guy wasn’t.” The media pushed this to the hilt; and much of the public bought it; giving stuff away is cool — especially when it’s others people stuff — and perceived as philanthropic. Yep, the key lies not so much in avoiding “cool” as in defining it. If conservatives don’t make any attempt to change the definition of cool–if they just try to ignore it (or, worse, co-opt it)–it’s like standing in the ocean trying to ignore the waves, except the waves come at you from random directions at random times, and sometimes drop out of the sky. And if you think that trying to push “cool” in a more conservative direction is a futile task, just remember all of the goofy things that have been considered cool. 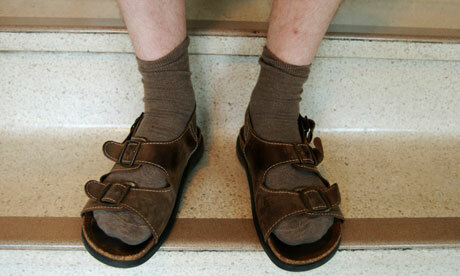 During a brief period at the height of the Birkenstock craze, it was even considered cool to wear socks with sandals. Socks with sandals, people. If that which is the very definition of uncool can become cool, then conservatives should be able to do at least as well as that.